The term "hornet" is often used to refer to many of the wasps that build large papery nests. The most notable paper wasp is the baldfaced hornet, Dolichovespula maculata, and several species of yellowjackets (Vespula sp. ), which are really wasps. In actuality the only true hornet found in the United States is the European hornet, Vespa crabro L.
Baldfaced hornets may be best described as large, black and white, heavy-bodied wasps about 3⁄4-inch long. They typically build exposed, mottled grey nests in trees or shrubs (Figure 1). Occasionally, the wasps will build nests under roof overhangs, in attics, crawlspaces and wall voids, or under decks or porches. The nests are constructed of a paper-like martial formed from chewed wood. The nests are often described as "football shaped," but they may exceed a basketball in diameter. Yellowjackets are housefly-sized wasps with distinct yellow and black markings and a few hairs. They construct a similar type of paper nest; however, it will be tan in color, much smaller in size compared to the hornet nest, and is usually found in an underground cavity. Common locations for nests are in lawns, particularly in sandy exposed areas, as well as at the base of trees or shrubs. Occasionally, yellowjackets nest in attics or walls, voids of houses, or storage buildings. Figure 1. Baldfaced hornet nest. An individual hornet or yellowjacket queen begins building a nest alone in the spring. Once a queen has produced enough workers to take over nest-building and foraging duties, she remains inside producing more offspring. The workers expand the nest, forage for food, feed the young and defend the nest. Like other predatory wasps, their diet consists mainly of other insects such as flies and bees. Baldfaced hornets also feed on their yellowjacket relatives. 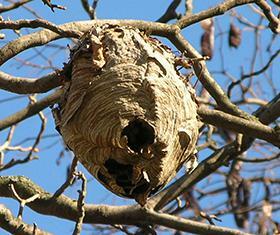 They continue to enlarge the nest until fall when there may be 300 to 400 hornets, or 600 to 800 yellowjacket workers. Frequently, it is not until this time that the nest is noticed, although it has been there for many weeks already. In the late summer, the colony produces reproductives, the insects that will mate. The mated female reproductives will serve as the next generation of queens the following spring. The male's main purpose is mating and they cannot sting. Nests are abandoned by wintertime and the future queens seek shelter alone, in protected places under tree bark, in old stumps, or sometimes attics. The current year's nests are not reused the following spring. Yellowjackets, in particular, may be late season pests around picnics, trash cans, and hummingbird feeders as they scavenge. The only way to control this situation is to locate and destroy the nest, which is rarely possible. As an alternative, keep all outdoor food and drinks covered when not actually eating. Drink from cups rather than cans where wasps can crawl inside (Figure 2). "Bee guards" or a coating of petroleum based chest rub can be applied on hummingbird feeders where the insects land. Trash cans should be kept covered or have a flap over the opening. Defensive behavior most often occurs when the insects are defending their nest from "intrusions" (including you walking by a nest or stepping on or near a yellowjacket nest. If the nest is not in the immediate vicinity the likelihood of stings is greatly reduced. 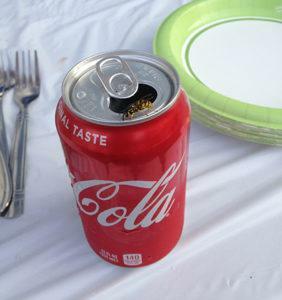 Figure 2 - Watch for yellowjackets landing on beverage cans. Control is best achieved by applying a pesticide directly into the nest opening. This can be done at anytime of the day, but near dusk, most of the wasps are more likely to be inside the nest. You can use any of the aerosol "Wasp & Hornet" sprays that propel insecticide in a stream about 10-12 feet. Direct the spray into the nest opening and then move away from the area in case any of the wasps emerge from the nest. You may need to repeat the treatment the following evening. If the nest is in a wall void or other inaccessible area in your home, you may consider hiring a pest control company to do the work for you. If the nest is in a wall, it may be desireable to remove it if convenient after spraying to avoid attracting carpet beetles that can invade the home and attack garments made of wool, silk, or fur. Yellowjacket traps (commercial or otherwise) have not shown to be of any value in reducing a yellowjacket problem. For more information, see the North Carolina Agricultural Chemicals Manual.